In an area known for lots of houses close together, a new development will up the density ante. 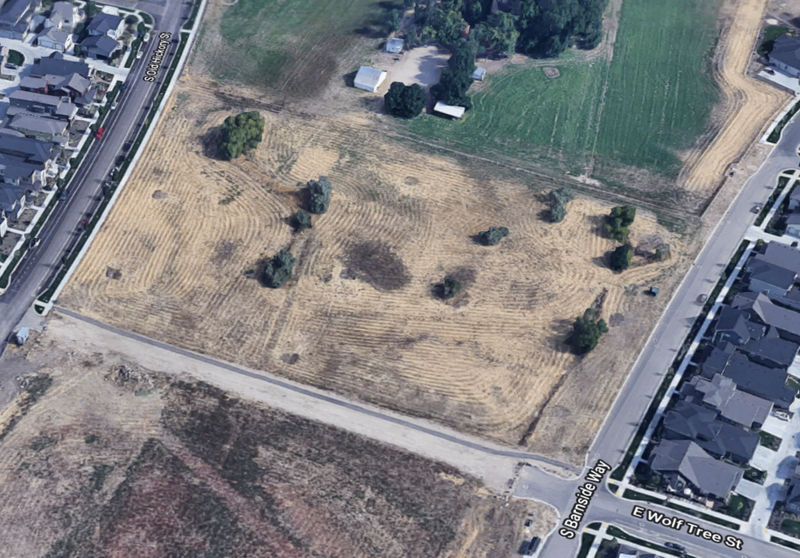 Boise Hunter Homes plans to construct 61 two- and three-story homes on a 6-acre piece of land in Barber Valley at the corner of Barnside Way and Wolf Tree Street. The development will have a density of more than ten homes per acre - with garages located off of alleys and an internal driveway system. The houses will range in size from 1,624 square feet up to as much as a whopping 6,419 square feet on three stories. "The Wolf Tree Square project will contain two distinct housing types that will complement the existing and future areas of development. The two housing types that have been designed for this parcel are a three-store elevated home (E-Home) and a motorcourt home." The project was approved by the Boise City Council in February and is set to proceed. The Harris Family and LeNir Ltd. have planned commercial across the street from the development abutting ParkCenter Blvd. UPDATE: The City of Boise is behind the demolition of three more homes in the Boise foothills, but remains tight-lipped about details. "The homes were damaged in the landslide and need to be torn down because of safety and nuisance concerns." When asked if the city ordered the demolition, if the city was paying for the demolition, and if the homeowners were in agreement with tearing down the homes, Journee said he could not comment further. BoiseDev later obtained the building permit, which was filed by Ideal Demolition Services - the same firm that tore down the initial homes. The permit lists City of Boise as the applicant for the demolition. We've also reached out to homeowners for comment. Homes already removed marked with a 🚫. 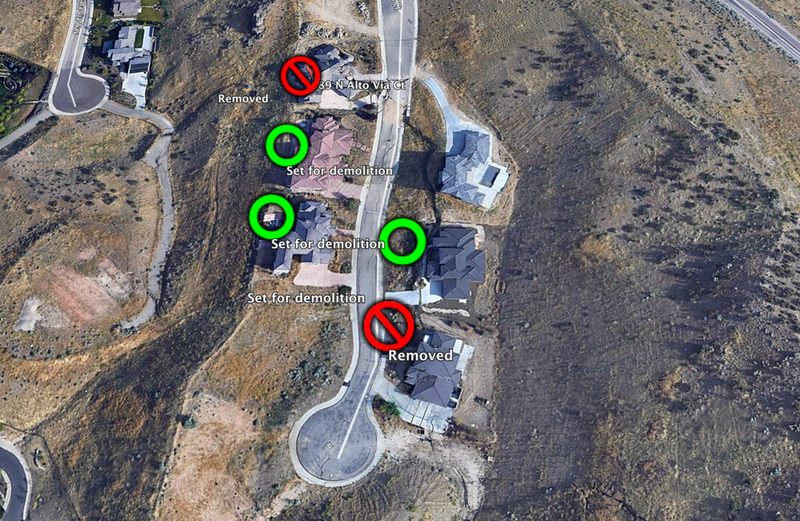 Homes set to be torn down marked with a green circle. Three more homes will be torn down in the Terra Nativa subdivision in the Boise foothills, according to records filed with the City of Boise. Ideal Demolition Services has asked to remove homes at 200 N. Alto Via Ct, 205 N. Alto Via Ct, and 241 N. Alto Via Ct.
Those are on the same street as two homes the City of Boise ordered removed last July due to extensive damage caused by a slow-moving landslide in the area. While the City of Boise ordered the first two homes removed due to public danger, it’s unclear why these homes are being torn down. All six homes on the block have been abandoned after a landslide started ripping the homes apart in 2016. The homeowners are involved in litigation with a raft of companies and individuals including developers Richard Pavalek and Timothy Day, engineers, real estate companies and the City of Boise. The former Neighborhood Housing Services is set to build a new "pocket community" in Garden City to add more affordable housing to the market. The orginization, now known as NeighborWorks Boise, will break ground on the 40th Street Cottages, and transform a weed-filled empty lot into 17 cottages. The homes will range from 686 to 983 square feet with two or three bedrooms. List prices run from $174,900 to $207,900. NeighborWorks is already underway on another project nearby with a similar goal - the Adams St. Cottages provide "sensibly priced" homes in a managed community - and the orginization provides grants and financial counseling to potential homebuyers. NeighborWorks defines a pocket neighborhood as "a cluster of neighboring homes placed together around a shared open space offering a sensible, compact, close-knit community, not dominated by cars." A groundbreaking event is set for Wednesday, with a grant of $205,000 from Wells Fargo. A large L-shaped piece of land near the United States Post Office is being graded ahead of development of a new apartment complex. The Skyline Apartments project will offer a number of units with views of southeast Boise and the foothills from the Federal Way and Targhee St. location. The project was originally announced in 2015, but delayed until final approval earlier this year. 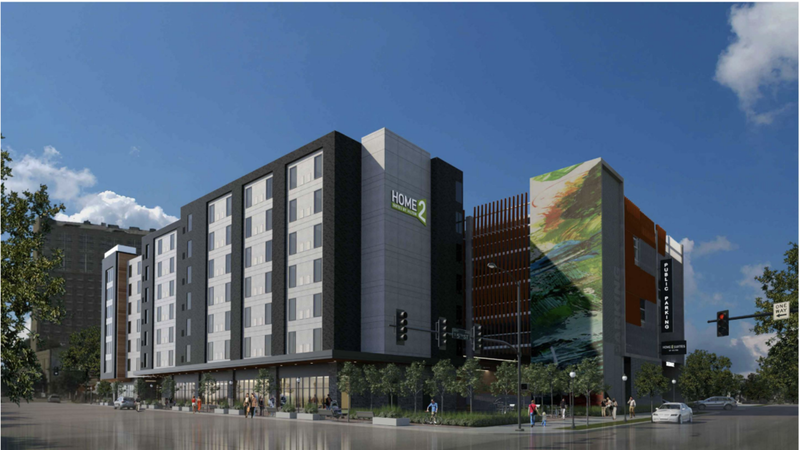 A new hotel is under construction in Boise, but it won't be a new addition to the downtown skyline. Guerdon Modular Buildings is constructing a new Mariott TownePlace Suites room-by-room at its plant off Federal Way. As each module is completed, it is loaded up and shipped to Hawthorne, California, a part of the Los Angeles Metroplex near the LAX airport. The rooms come ready-to-go with everything in place, from furniture and appliances down to the mini shampoo bottles and soaps on bathroom countertops. All they’re missing is bedding that will be added when housekeeping arrives for opening day. Thank you, Kyle Haugland, for the tip! A new senior living community is planned for Barber Valley. The 66-unit senior living apartment complex is set to be built on E. Warm Springs Ave. near old Eckert Rd, adjacent to an existing Idaho Power substation. 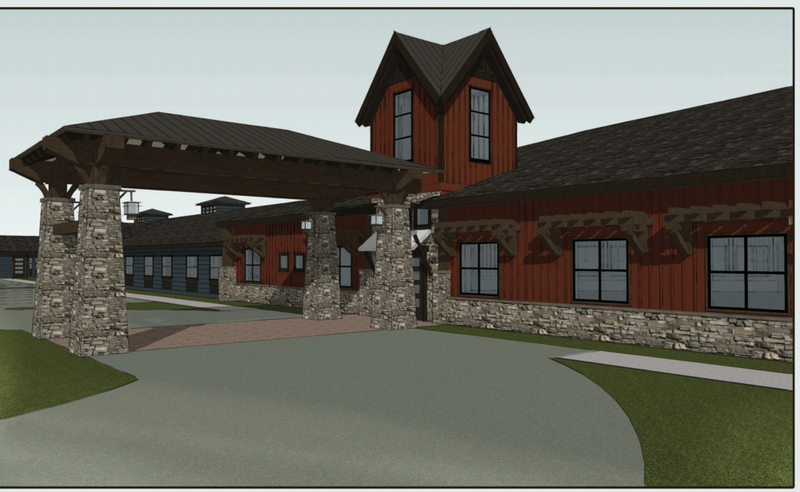 Aspen Valley Senior Living would feature 48,386 feet of space with parking behind the building. Features include a bistro, dining hall, salon, library, theater, activity room, outdoor kitchen and more. 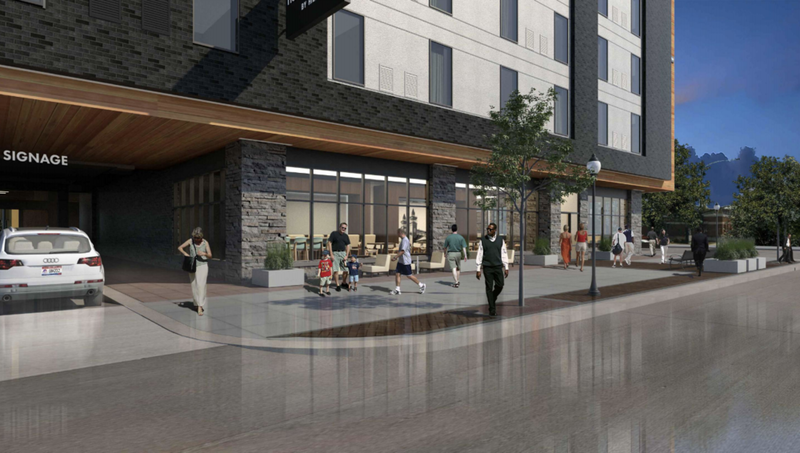 The project already has quietly worked its way through the City of Boise's approval process and is awaiting a building permit for construction. Boise City Council member and Capital City Development Corporation board member Scot Ludwig plans to build a pair of towers on land he controls at 5th St. and Broad St. in Boise. On the north corner, Ludwig would build a nine-story office and parking structure on the southeast corner of the intersection, and an 11-story condo building on the north corner. The two projects would be linked by a skybridge which will contain parking and a terrace over Broad St. - about 44 feet above the ground. Five levels of parking - including two that span over Broad St.
Three stories of office space. The project will need to be approved for both a conditional use permit and get design review approval, as well as a variance. The allowed height for buildings in the area is currently six stories, but Ludwig and his team are proposing to go as high as 11-stories. Correction: An earlier version of this story stated LocalConstruct was a developer on this project. Ludwig is the only developer listed. The Idaho building at 8th and Idaho Streets is set to get an update. New balconies are planned for the 3rd, 4th, 5th and 6th floors on the south and east sides of the buildings - the areas away from the 8th Street corridor. 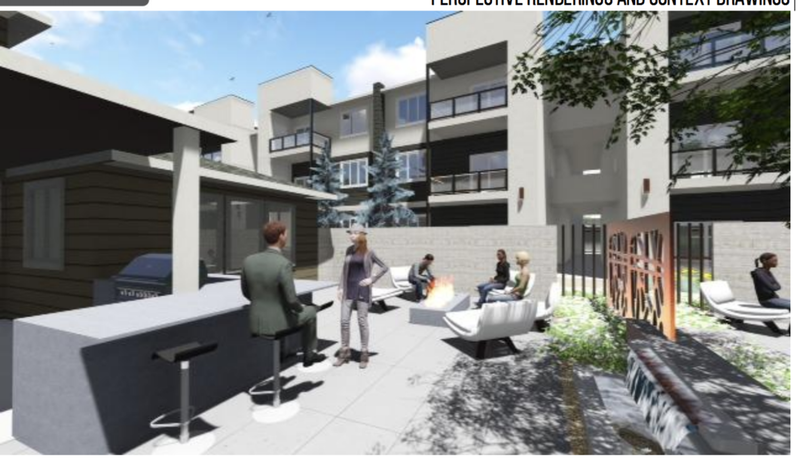 "The new balconies will provide desirable, private outdoor space for a number of the apartment units in the Idaho Building," architect John Price wrote in the application letter to the City of Boise. Developers have changed their plan for 126 apartment homes on Warm Springs Ave. in Barber Valley. 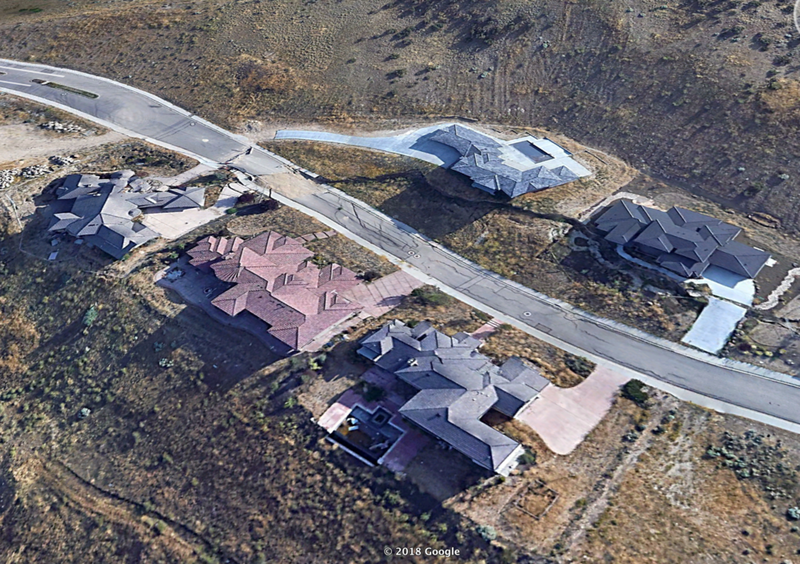 BoiseDev was the first to report on the planed Barber Hills Vistas project in April. The project met resistance of neighbors in the nearby Dallas Harris Estates subdivision (disclosure: I own a home here). The new plan replaces the apartment complex idea with 47 homes with alley-loaded garages, similar to the neighboring Harris Ranch development. 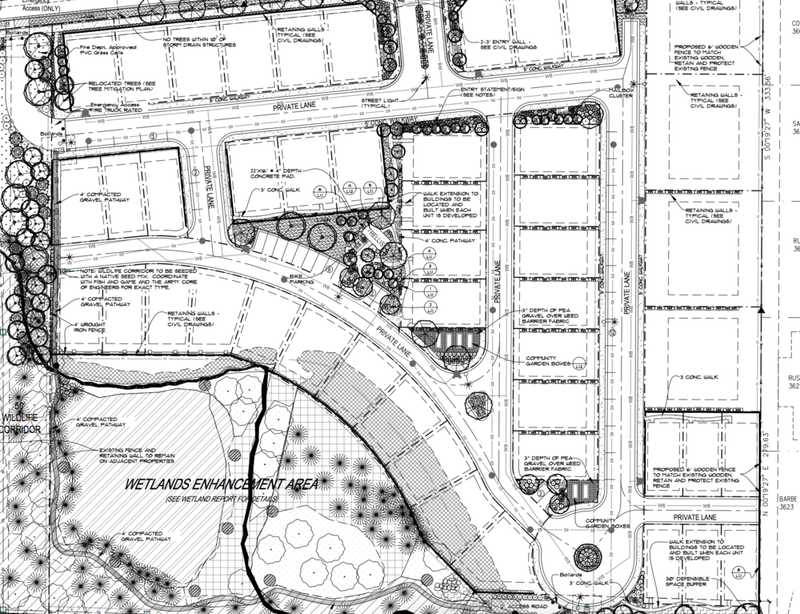 It would also include a 50 foot wildlife corridor along the west side of the property, as well as a "wetland enhancement area" that would be adjacent to an existing pond an nature trail area owned separately. A patch of mostly bare land in the North End near Hillside Jr. High could soon be home to 27 new homes, according to a notice sent to neighbors. The Forsythia Subdivision would be built at 3257 W. Hill Rd. near 33rd Street. The 3.92 acre lot would feature lots for the new homes, plus three common areas. It currently has a pair of homes and several out buildings on it. W. Lassen St. would be extended through the site. A neighborhood meeting with RiverRidge Engineering is slated for 6 p.m. on Tuesday at the project site. A formal application has not yet been filed with the City of Boise. Courtesy Sawtooth at Skyscraperpage - aka Sean G.
We've received quite a few questions about the construction happening at 5th Street and Idaho Street in Downtown Boise. A former parking lot and mortuary are currently a hub of activity as construction crews work on a new structure. A five-story apartment and retail building is under construction - plus a small pocket park. 5th & Idaho LLC is behind the project - a group of developers that includes Clay Carley, Dean Pape, Tim Gibson and Peter Oliver. Eighty apartment units ranging in size from 542 square feet to 1,246 square feet. Six of the apartments will be walkup style - three along 5th St. and three along the alley near Ochos. Those six will have two levels, with a loft above the ground level. A 3,040 square foot retail space for a tenant to be announced. A rooftop deck overlooking the pocket park. An amenity room for residents on the top level. The building should open next year. Our friend Eric Turner at Shutter Sky Films shot this aerial video of the Gardner Co. Pioneer Crossing project in Downtown Boise. The video shows the first three floors of the parking garage at 10th and Front St. poured. The garage will eventually be either four or five stories - depending on the outcome of a request with the City of Boise. The future Hilton Garden Inn location at 11th and Front has about the first floor framed in. Eventually that hotel will feature 132 rooms over five floors. We've had a flurry of tips and questions wondering what is up with the torn down building at 15th St. near Rhodes Park. Below, the original story on the project. Developers had hoped to save exterior walls - but apparently could not and tore everything down. The Capital City Development Corp. has pledged money to the project to improve the streetscapes around it. The area around Rhodes Park in downtown Boise is unique - with old industrial, some commercial, and often a gathering place for Boise's homeless. One development group wants to add housing to that mix -- high-end housing at that. "Verraso is an intriguing development consisting of eight high end apartments build around a large open veranda that creates a "zen" like atmosphere. The project repurposes an old dilapidated warehouse on the corner of 15th Street and Front Street. The architectural lines are articulated and varied. There are several appendages and colors creating unique, organic relief and symmetry. Each residence has a one car garage. The perimeter landscape will provide privacy and luxury. With careful, painstaking us of modulation the fresh new feel will be the new darling of downtown Boise. The project would take the old warehouse building that was last home to Casa Nova consignment - which closed in 2006. Many of the units would have garages along the alley off Front St. The project is built in the literal shadow of the elevated I-184 Connector, and is just a few yards from where a motorcycle skidded off the freeway and landed below, killing the cyclist. P&Z meeting set for early January. Local Construct wants to build an apartment complex on a large piece of land it owns in the western part of Downtown Boise -- but hasn't been able to snag a grocery store, according to the Idaho Statesman's Sven Berg. BoiseDev first wrote of the hope for a grocery store on the site earlier this year.